There were a few players rested last weekend and there's a good chance more will miss out on starting XIs for Gameweek 17. After Liverpool and Tottenham did enough in their midweek matches, both will advance to the next round of the Champions League, but that's also cause for celebration and a reason some could be rested ahead of the holiday fixtures. The problem is that Spurs have the easiest matchup of the week at home against Burnley. Both Harry Kane and Christian Eriksen played 90 minutes at Barcelona, and it wouldn't be surprising if both were dropped again, similar to the squad at Leicester. Not only did Erik Lamela return from a recent injury, but Fernando Llorente is still on the roster and Lucas Moura could easily get another start. I'm not saying not to captain those guys, only that there's a considerable amount of risk involved with them, especially with the quarterfinals of the League Cup next Wednesday. The unfortunate thing is that Liverpool host Manchester United, which is normally the type of matchup to avoid. However, the Red Devils are coming off a trip to Valencia, whereas Liverpool stayed home and are out of the League Cup. This isn't the most favorable spot, but Liverpool have dominated at home, scoring 15 and allowing only one goal in league play while scoring eight and allowing two in the Champions League. It also doesn't hurt that United have struggled away, allowing 15 goals in eight road matches. Mohamed Salah has found a bit of form with four goals in his last two matches, but he's also created seven chances in that period, which only adds to his score-sheet possibility. 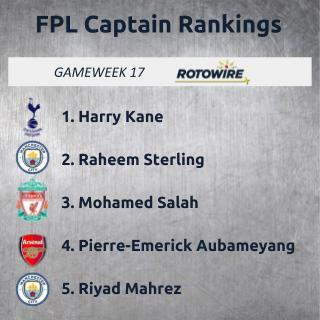 Salah is still the only player I'd consider for the armband on the Reds, with Andrew Robertson slightly ahead of Roberto Firmino and Sadio Mane because of a possible clean sheet. Manchester City are the other big club at home, taking on Everton, who have scored one and given up five goals in recent trips to Arsenal, Man United, Chelsea and Liverpool. As for City, they were also home in midweek and have a trip to Leicester next Tuesday, but it's hard to ignore their 30 goals in eight matches at the Etihad. There's no telling who will start for the Citizens, and Sergio Aguero's possible return only adds to that. Unless he is labeled out, Aguero and Gabriel Jesus are both off my list. Raheem Sterling is often the most consistent player in the lineup, and with David Silva injured, there aren't a ton of other places to turn for City outside of Phil Foden and Ilkay Gundogan, both of whom started Wednesday. Because of that, both Riyad Mahrez and Leroy Sane are worth a look for the armband. It's not easy deciding between the two, though not many fantasy squads have both. Mahrez is averaging 1.67 shots on goal and 1.67 chances created per 90 minutes, while Sane is at 1.31 and 2.40, respectively. Mahrez also didn't play against Hoffenheim, while Sane played the full 90. If you're not into big favorites, Chelsea (at Brighton) and Arsenal (at Southampton) are up next. The Gunners have the better matchup as Brighton have been surprisingly good at home, while Southampton are the only team without a win at home this season. Arsenal don't have anything to play for in the Europa League on Thursday, which means Pierre-Emerick Aubameyang is ready to go for this weekend and gets the nod ahead of Alexandre Lacazette after both starting didn't work against Huddersfield. Aubameyang produced more coming off the bench, but he has 14 shots and five chances created in his last four starts and has the best odds on the team to add to that total. Eden Hazard isn't as easy to trust because his goal scoring has dwindled, failing to find the back of the net in his last six starts, though he has seven shots on target in that period. He's still in the running for an assist as defenses are putting everything into stopping him, but that leaves teammates open. Hazard's not in my top five, but he's right on the cusp. Once again, the differential crowd is limited to Aleksandar Mitrovic and the rest. Mitrovic is always a possibility whenever he's at home, though there's still some doubt because West Ham haven't allowed more than one goal in their last five away matches. At the least, five of Mitrovic's seven goals have come at home, and he's averaging two shots on target per outing. And because the Fulham back line is so bad, some could even turn to Chicharito, Felipe Anderson or Robert Snodgrass. That's surely a stretch for the armband, but the Hammers have scored three in each of their last three. Wolverhampton against Bournemouth will be one of the harder matches to predict since these teams are either playing well or playing terribly. It also doesn't help that Raul Jimenez was dropped to the bench last match and may not be a guarantee to start. Wolves are allowing at least one goal per match, but the hamstring injury to Callum Wilson puts a damper on things for the Cherries. If you really want to stretch on a captain, Andros Townsend is averaging close to a combined four shots and chances created per match, so that could lead to something at home against Leicester. The problem is that Wilfried Zaha, is suspended so he's not there to help.